Phosphatidylserine is the most abundant phospholipid in the brain and performs vital functions to support normal cognitive function. Phosphatidylserine has an enviable safety record: in human clinical experience over 15 years and many thousands of patients, not a single adverse event has been reported. The dose used in almost all human studies was 300 mg/day. 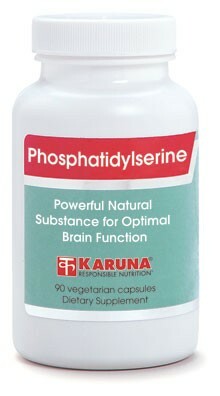 Phosphatidylserine is the most abundant phospholipid in the brain and is vital for normal membrane function of cerebral neurons (Nutrition 1999;15:778-83). Administration of phosphatidylserine is thought to support normal neuronal function (Neurology 1991; 41:644-9) and adequate production of neurotransmitters (Psychopharmacol Bull 1992;28:61-6). Clinical studies show supplementary phosphatidylserine helps promote normal brain function in older patients (Ageing (Milano) 1993;5:123-33; Altern Med Rev 1996;1:70-84). Phosphatidylserine may also play a role in stabilizing mood, according to preliminary clinical research (Acta Psychiatr Scand (Denmark) 1990;81:265-70). Suggested use for adults: Three capsules daily in divided doses, or as directed.